The white coral necklaces are some of my favorite pieces. They are calming and strengthening without the heating influence of red coral. White coral has a lovely feel to the wearer and is strengthening to the benign influences of Venus. 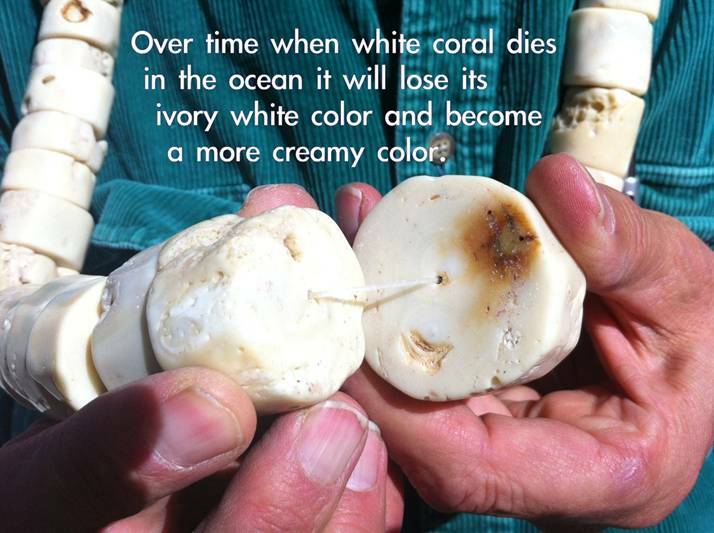 Before we go more into its benefits, the tricky part is locating the correct type of white coral. This ayurvedic material has been greatly misunderstood by gem dealers around the world. 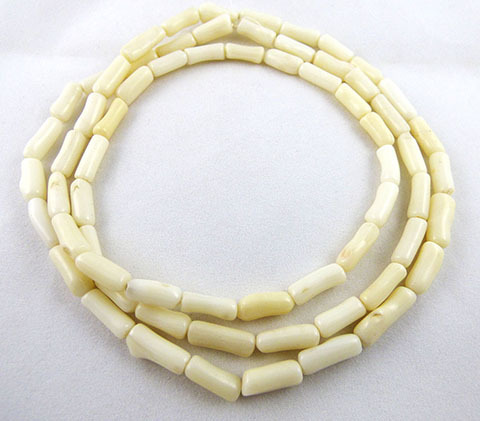 The great majority of white coral necklaces are sponge or reef white coral, although they are white, they are not solid and have thousands of little air bubbles to the square centimeter. 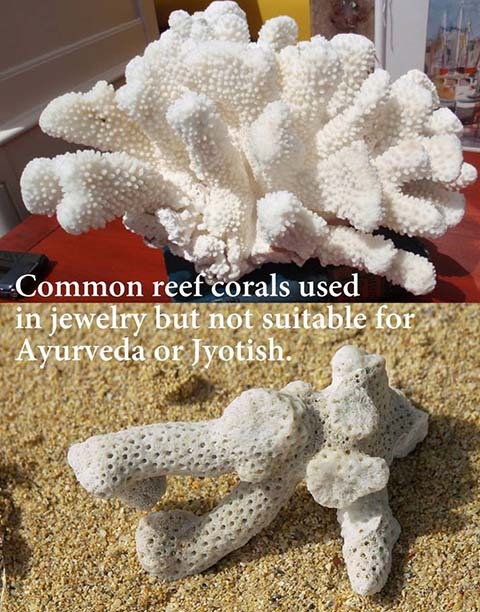 White sponge corals, though abundant in the tropical reefs around the world are not of the variety recommended by the Ayurvedic or Jyotish community. Just as red coral or corallium rubrum is highly carbonated so also is the recommended variety of white coral. 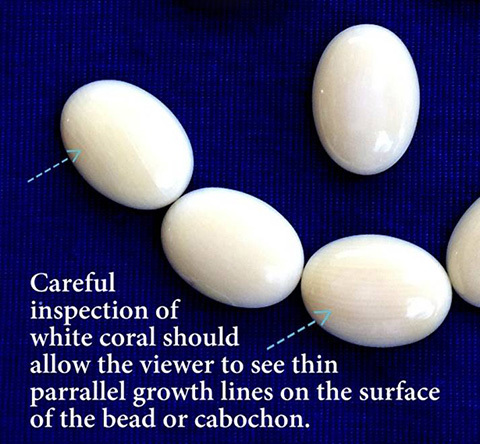 If the white coral cannot take a high gloss polish when tumble polished, then it is not a variety considered helpful to the electro magnetic body. Soft materials are not generally able to take a high polish and this is an indicator of hardness. 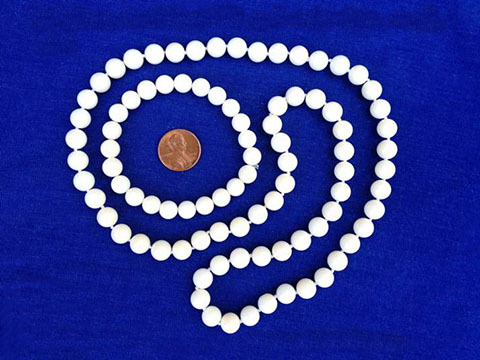 Above is an example of inferior, unsuitable white sponge coral beads. Notice the holes on the surface. Sponge, stoney, organ, lace and fire white coral are not precious varieties and though their holes are often filled in with a resin to imitate its much more precious cousin they are also not considered suitable for ayurvedic or astrological purposes. 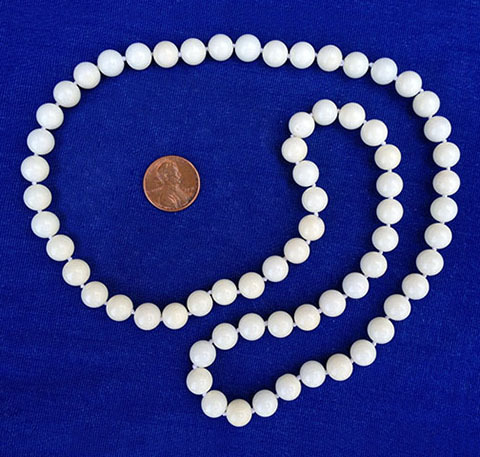 We only use natural, unaltered, carbonated, astrological white coral in our items. 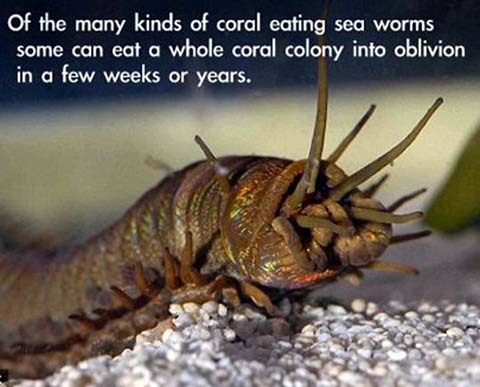 Altering the coral in any way such as by the use of dye or filling holes with resin lessens its effectivenes. 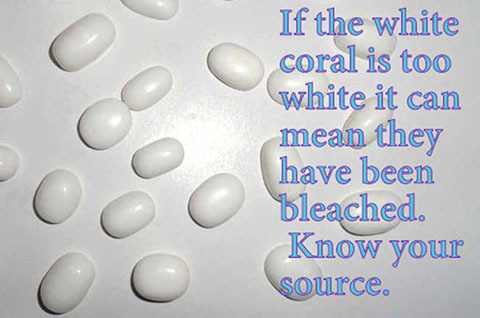 Be sure to avoid bleached white coral varieties. Most brilliant white coral is not in its original or natural state and is also not considered suitable for ayurvedic astrological purposes. 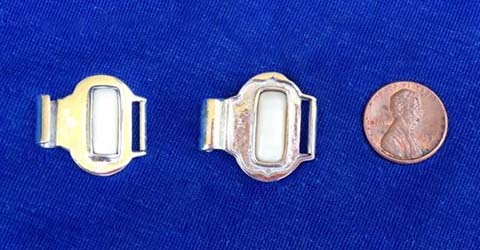 By using strong bleaches a white ivory colored coral can be made into a brilliant white color, this treatment process is seen a lot in India. As a general rule, if the coral is a brilliant white it has been bleached. Most suitable precious coral is a bright white color with an ivory to white undertone. Precious white coral grows at great ocean depths and the sun does not have a bleaching effect on it in its pitch black habitat. Round 8mm calibrated, 24 inch genuine red coral necklaces have tripled in price in the last three years. (2012). The rarity of genuine undyed red coral necklaces in this size travel up to $12,000 and more. 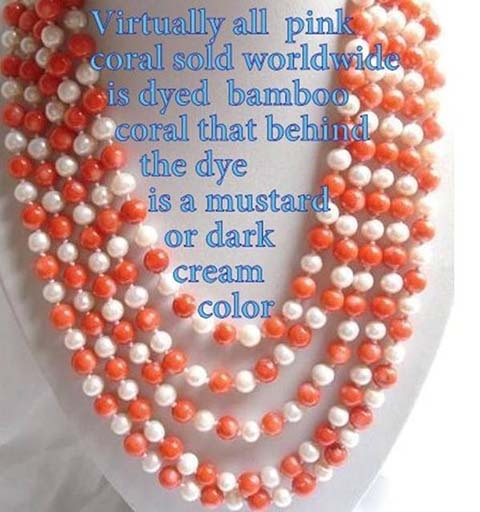 Many readers may think that they have seen an inexpensive red coral necklace for a hundredth of that price when in fact it is merely a creamy mustard colored variety of bamboo coral that has been dyed red with an aniline dye that will not react to vinegar or most mild acids. The simplest way to test if large beads are genuine red coral is just to crack one open as the dye seldom penetrates more than 6mm into the bead. Another method depending on the type of dye, is to apply a strong nail polish remover. Because of the high cost of round red coral beads we sell the much more inexpensive but genuine undyed natural red coral tube shaped bead necklaces. 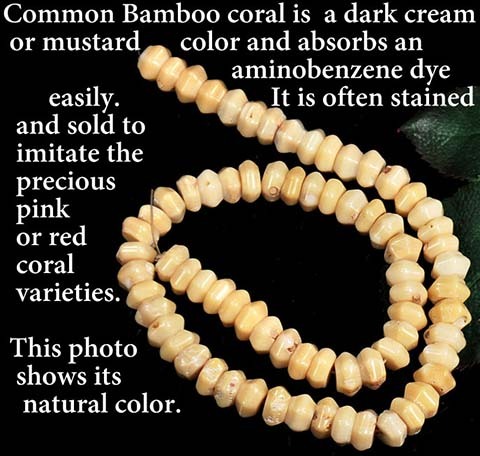 Again 99% of all red coral tube necklaces are dyed mustard color bamboo coral so you really have to be sure you are purchasing from a specialist supplier. 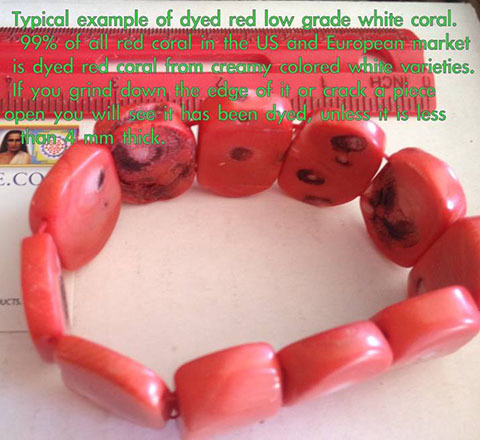 To import red coral one needs a special import license and I have one or I could not sell genuine red or white coral at reasonable prices. My business is about going to the source and importing from the mine or supplier who has the best quality at the lowest price. To protect the environment in a sustainable manner the federal authorities need to monitor the volume data of different species being imported to control and regulate international limited marine farming permits. They accomplish this by selectively granting a special import license to certain importers so they can monitor the precious varieties of certain corals to ensure they are not being over farmed. 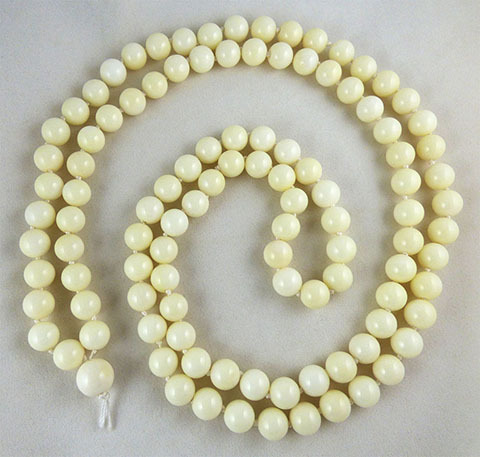 Astrogems has this special import license and has purchased and legally imported a large parcel of unbleached white coral beads at an exceptional price. The reason I don't name the type of genus of the 34 white coral species on this webpage, is in order to protect it from opportunist harvesters. 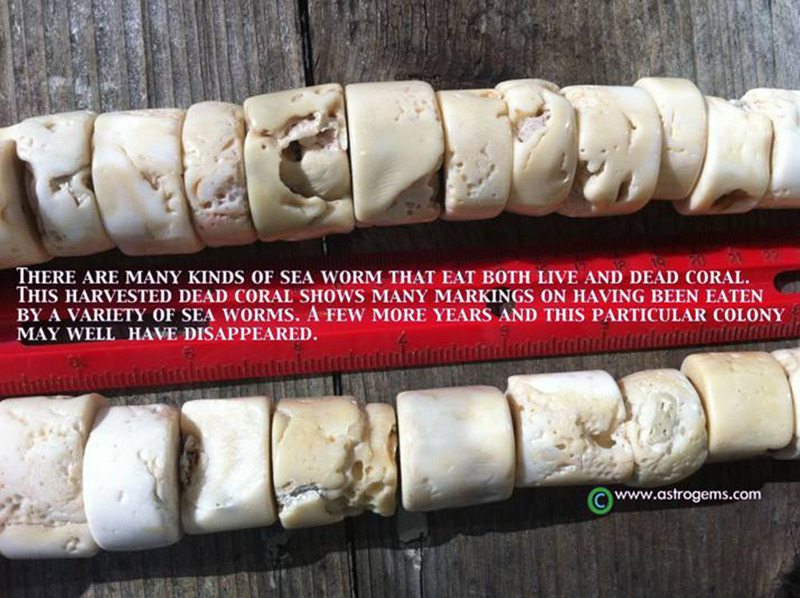 White Coral can stand on the sea floor for hundreds of years after death and the ideal is to harvest them before the sea worms do too much damage and the elements have changed the white ivory color to a dark creamy color. As you will know from the red coral necklace story, red coral (corallium rubrum) is a very special material in necklace form for increasing the metabolic rate. 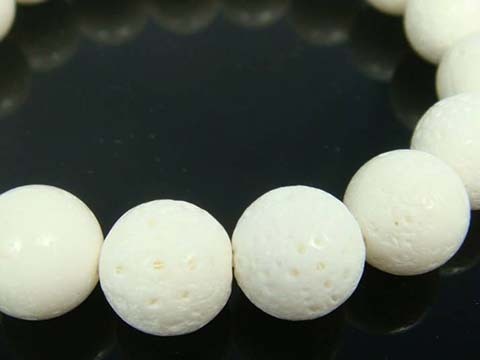 Unbleached naturally carbonated white coral is good for meditation and its calming influence. White coral is also strengthening to the metabolism without the heating vibration of the red color. 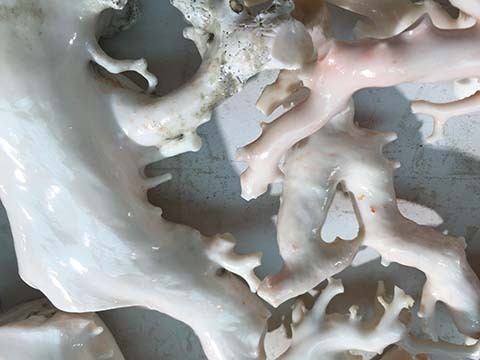 The rarer white carbonated corals used for expensive jewelry often comes from depths of 400 to 1200 feet and are not generally found in the shallow reefs of the world. They do not come from the Mediterranean as so many sellers suggest but are found in the depths closer to east Asia, Tasmania and the Pacific. As a Venus stone, white coral is a recognized substitute for the Diamond and white Beryl or white Sapphire. 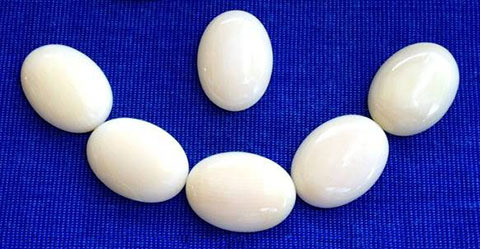 White coral is also respected as a substitute stone, due to its lower cost. 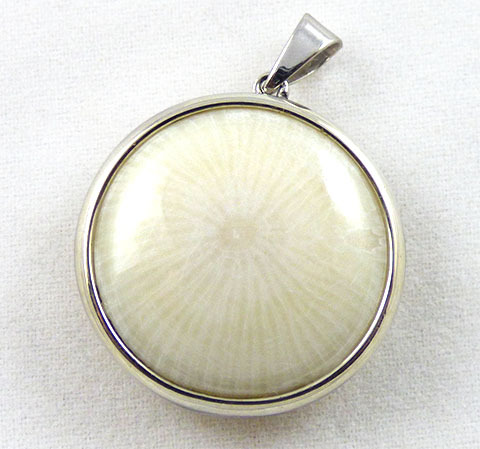 Apart from the astrological effect, white coral has good medicinal properties. In structure and formation, it is similar to red coral, except for the color. 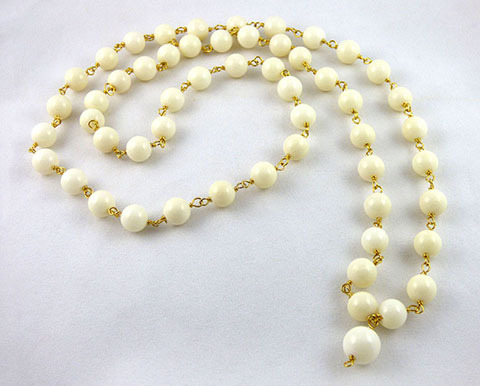 The difference with white coral though, is that the material can affordably be worn as a necklace with a wide skin contact area unlike white Beryl or white sapphire and it is also a lot less expensive than red coral. 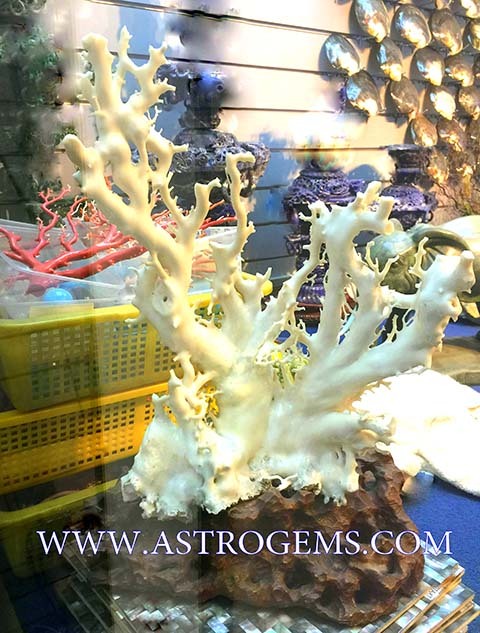 Vedic or Jyotish Astrologers promote white coral as increasing a liveliness and loveliness of character, aiding one to be more bold, inspiring one to take better care of their health and strengthening their will power. It enhances one's standing within the social and family environment and bestows an influence on the wearer with a willingness to execute their planned objectives and lessen the habit of procrastination. As a Venus stone it is often worn for bringing peace and marital happiness. It is also meant to help increase attractiveness of communication. My personal observation with it is that one sometimes hears of the wearer getting a mild headache when wearing it after about a day and this is put down to the added calm energy helping the person to do a detox in the cerebral area which manifests for an hour or so and then passes. 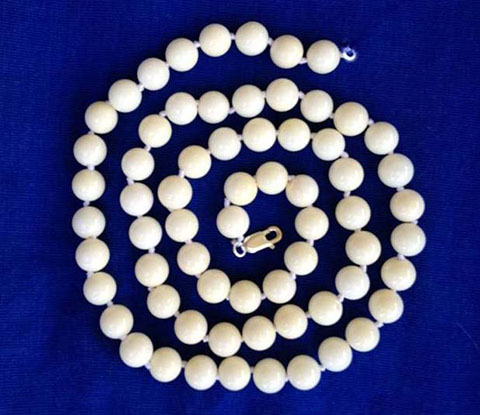 White coral necklaces are considered to offer a supplementary electro magnetic frequency similar to an elevated or very well positioned Venus in the horoscope. 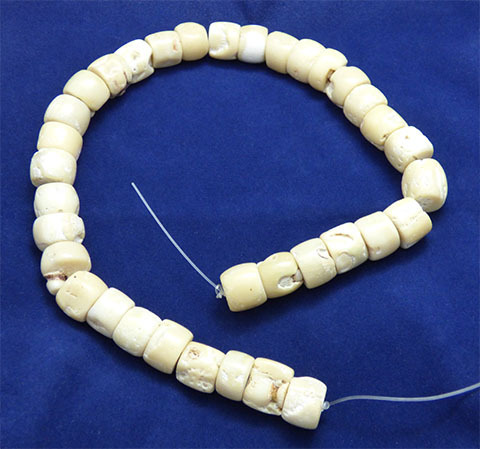 In more recent times, white coral has become considered to be good for earthing the wearer as some genus have been earthed for up to a hundred years or much more. 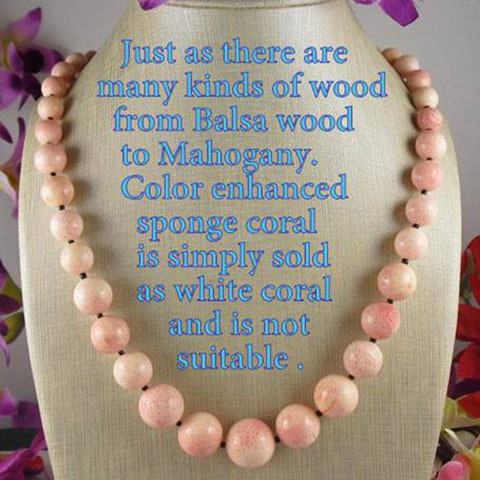 Genuine white coral can have salmon or pink overtones but that is very rare unlike the dyed varieties. When you click on the photo or add to cart button, you will be taken to our sister site Hearts for Love where you may read more details about the item, see additional photographs and also purchase the item.